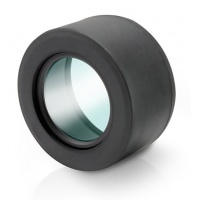 The pure fluorite crystal used in the Kowa TSN-884 Straight Spotting Scope is the optimum optical material for reducing chromatic aberration, providing the ultimate viewing experience. The extraordinary light gathering capability supports observation during dusk and during dawn. Kowa TSN-884 is waterproof to JIS protection class 7 and filled with dry nitrogen gas to prevent the lens from fogging. JIS 7 = Japanese Industrial Standard / class 7 = Protected against the effects of temporary immersion in water. Don't go Leica, Swarovski or Zeiss till you've tried one of these. I am delighted with this telescope, optics are superb, even 60X. Full field of view while wearing glasses throughout the magnification range, top notch build quality, really an all round quality package. I would recommend to anyone without hesitation.